So, for the last few weeks I have been posting entries with recipes, cooking tips, and stories of my cooking successes and follies. I thought it was about time to give you a tour of The Kitchen where all of the cooking magic happens. In fact, it’s just two tables and a stove. However, I thought that it might be interesting for you all to see how much can be accomplished in such a small space with very few pieces of equipment. So, here we go! Welcome to my kitchen. This was my original kitchen, prior to the cooking challenge. This was the only table I had to store all my food and prepare all my food. My rack of non-perishables and spices is off to the right, and my covered plate of veggies and other foods is on the left. 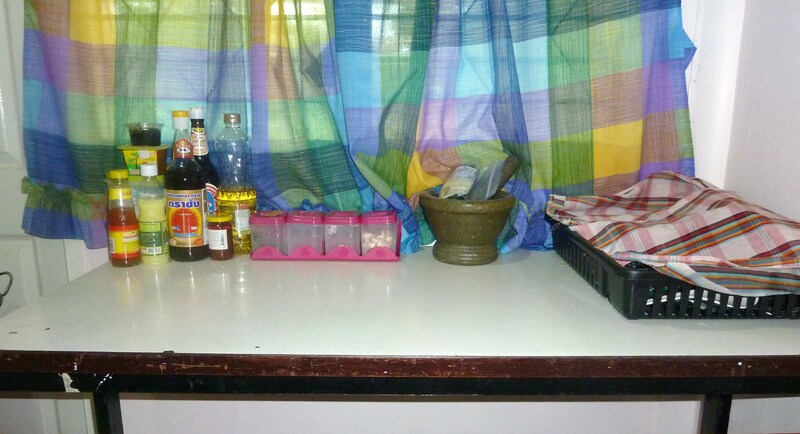 For someone who loves to cook and bake, it took some getting used to having only this small tabletop area to make the magic happen. This is the original table, but in it’s new form. I added a second table (description and picture below), which opened up some new space on this first table. 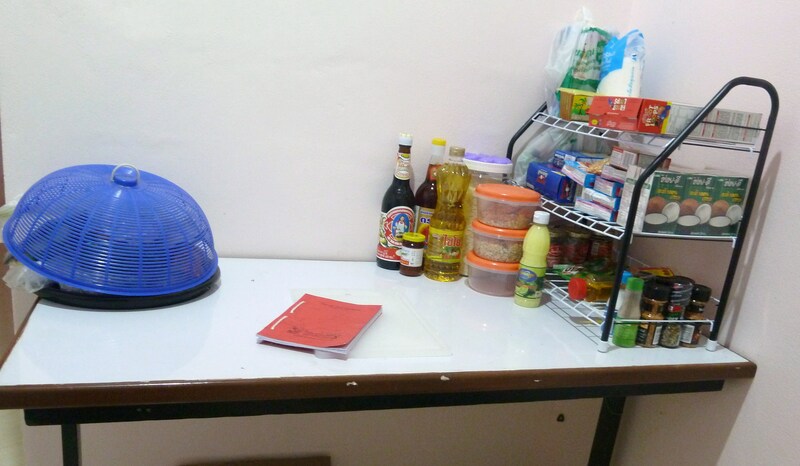 I now have room for my rice cooker (in the middle) and my water heater (in the back). There is still a little bit of room for actual prep and cook but the majority of that is done on the new table. This is my one shelf in the kitchen. 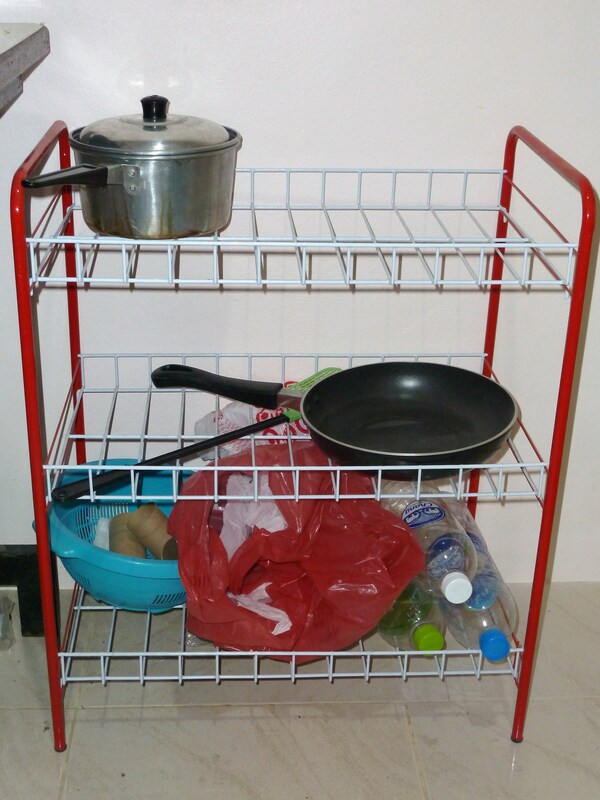 Mainly I store my pots and pans here (some are currently waiting to be cleaned from today’s cooking adventure!). I also store my cleaning supplies near the bottom. I’m thinking of getting another. Things here can get a bit cluttered! And this would be my stove. Yes, this is it. 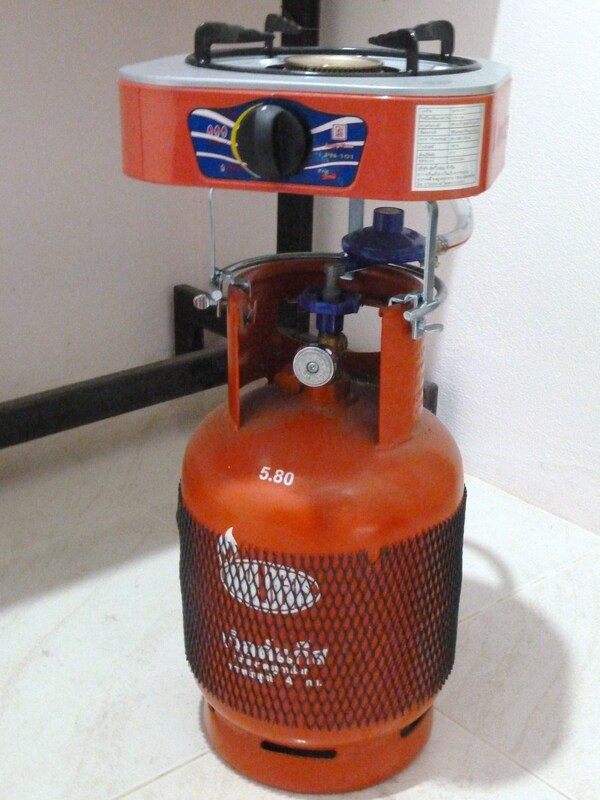 This tiny little gas powered stove is where all of my cooking adventures take place. I’m not all that happy with it. When I was just making soup or Mac ‘n Cheese it definitely did the trick, but now it’s proving a bit more difficult. Trying to balance a wok or pot, trying to get the right heat. It’s all rather difficult. But, it’s what I have and sometimes you just have to make the best of it! … my bathroom. 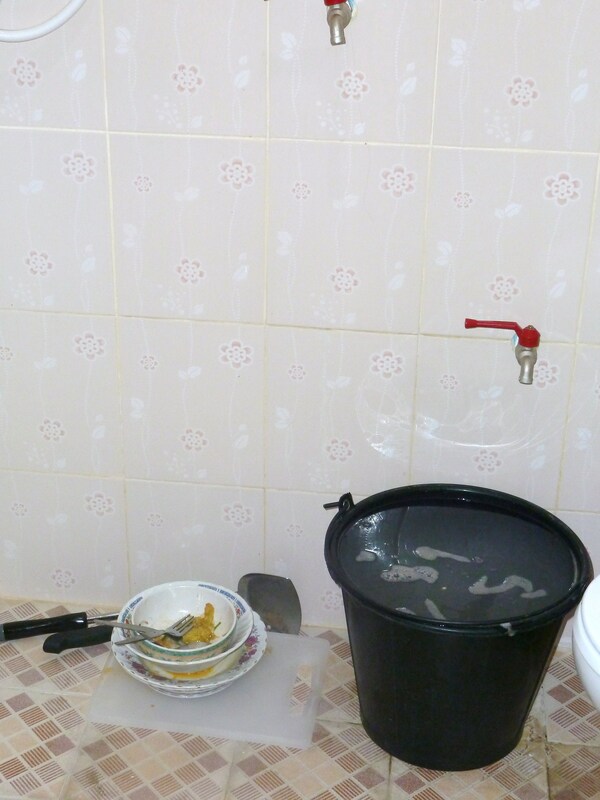 I have no sink. I have no dishwasher. All I have is my bathroom floor. This is where all my cleaning happens. I promise, it’s sanitary. I don’t actually set anything on the floor once washed — it moves directly to the tables in the kitchen for drying. As you can see, my next project is to clean up from today’s cooking adventure! This is the cookbook that started this entire cooking challenge. I received this cookbook during the cooking class up in Chiang Mai and it has provided the majority of my recipes so far. This was the inspiration for this entire blog and cooking adventure and will continue to provide new recipes, ideas, and motivation. I love it! 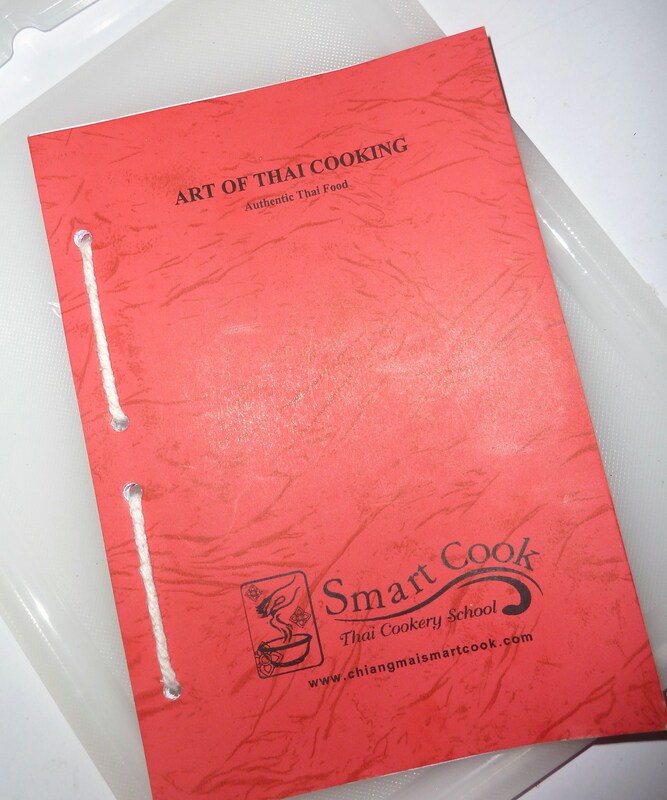 Thank you Smart Cook Chiang Mai! 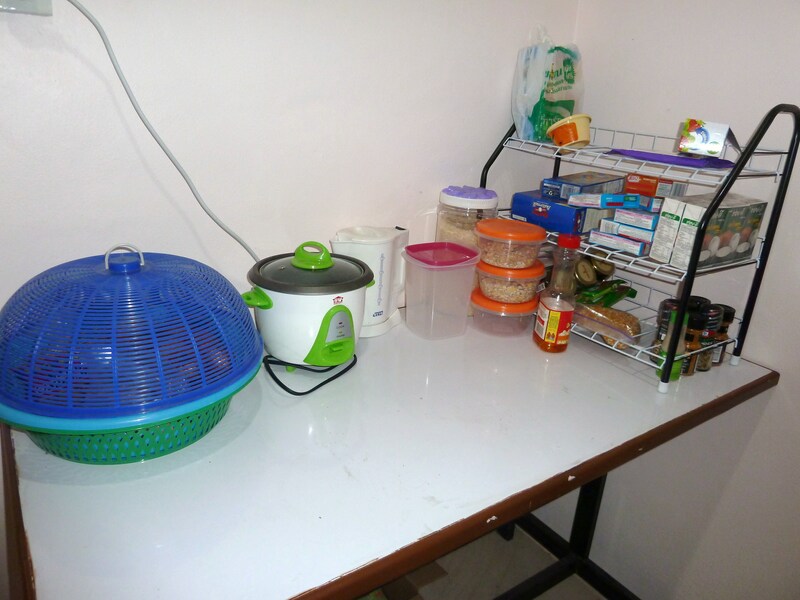 So, there you have it … the brief tour of my very small kitchen. And, when you are reading through the recipes and pictures and wondering whether you would be able to pull this recipe off, just remember what I’m working with! If I can do it, you most definitely can too! I am loving this! Your kitchen looks amazing. I canNOT wait to come and visit and have you cook for me! Oh wow, you seriously are making magic! Great job dear! Thank you! I’m doing what I can. It’s not a pretty sight in the midst of cooking but the final products are pretty good so far! You are amazing Ky. You are doing so much with sooo little. We all need to lean to appreciate what we have and like you said make the best of it. I think we need to get your cooking blog into a magazine or other medium….you’ll be famous! Next your own TV show!